Download "Building the bottom line in employed physician networks"
1 Building the bottom line in employed physician networks Greg Mertz, MBA, FACMPE, Managing Director, Physician Strategies Group, LLC, Virginia Beach, VA Shrinking margins, rising costs, and the specter of cuts in reimbursement are all cause for concern. The cumulative impact of these factors has brought renewed focus on losses associated with hospital employed physician networks. The Medical Group Management Association (MGMA) reports that median losses per FTE hospital employed physician are nearly $200,000 per year. When you exclude those hospitals that aren t losing any money on their program, median losses jump to close to $250,000. This is further complicated by the fact that more than 70% of hospital executives indicated that they intend to expand their employment programs over the next year (HealthLeaders, 2011). Employing expensive specialists will only amplify the problem. The result of this situation is that an increasing number of hospitals, that employ physicians, are taking steps to bring those losses into a more sustainable range. Think of losses as a three legged stool. Each leg represents a contributor to overall loss levels: physician compensation, revenue cycle, and operational overhead. Shortening the stool (losses) requires that you adjust all three legs or the stool becomes unstable. 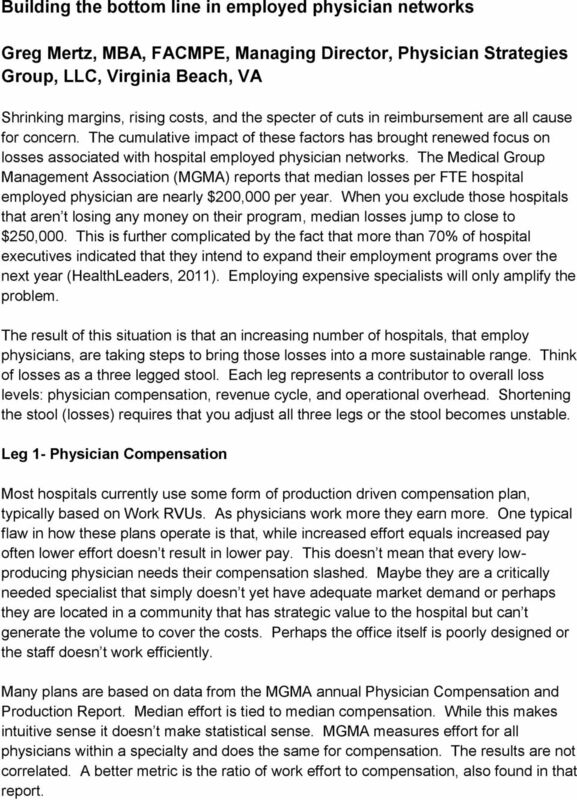 Leg 1- Physician Compensation Most hospitals currently use some form of production driven compensation plan, typically based on Work RVUs. As physicians work more they earn more. One typical flaw in how these plans operate is that, while increased effort equals increased pay often lower effort doesn t result in lower pay. This doesn t mean that every lowproducing physician needs their compensation slashed. Maybe they are a critically needed specialist that simply doesn t yet have adequate market demand or perhaps they are located in a community that has strategic value to the hospital but can t generate the volume to cover the costs. Perhaps the office itself is poorly designed or the staff doesn t work efficiently. Many plans are based on data from the MGMA annual Physician Compensation and Production Report. Median effort is tied to median compensation. While this makes intuitive sense it doesn t make statistical sense. MGMA measures effort for all physicians within a specialty and does the same for compensation. The results are not correlated. A better metric is the ratio of work effort to compensation, also found in that report. 2 Before attempting to correct any compensation/effort disparity take the time to fully study the factors behind the reality. Proceeding with this understanding will, at best, create bad will within the physician group and, at the worst, may lead to the loss of valuable physicians. 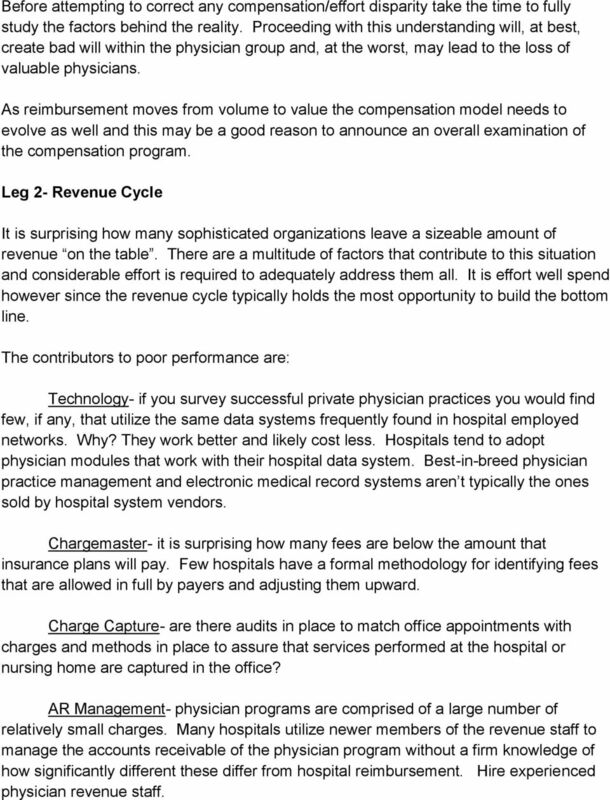 As reimbursement moves from volume to value the compensation model needs to evolve as well and this may be a good reason to announce an overall examination of the compensation program. Leg 2- Revenue Cycle It is surprising how many sophisticated organizations leave a sizeable amount of revenue on the table. There are a multitude of factors that contribute to this situation and considerable effort is required to adequately address them all. It is effort well spend however since the revenue cycle typically holds the most opportunity to build the bottom line. The contributors to poor performance are: Technology- if you survey successful private physician practices you would find few, if any, that utilize the same data systems frequently found in hospital employed networks. Why? They work better and likely cost less. Hospitals tend to adopt physician modules that work with their hospital data system. Best-in-breed physician practice management and electronic medical record systems aren t typically the ones sold by hospital system vendors. Chargemaster- it is surprising how many fees are below the amount that insurance plans will pay. Few hospitals have a formal methodology for identifying fees that are allowed in full by payers and adjusting them upward. Charge Capture- are there audits in place to match office appointments with charges and methods in place to assure that services performed at the hospital or nursing home are captured in the office? AR Management- physician programs are comprised of a large number of relatively small charges. Many hospitals utilize newer members of the revenue staff to manage the accounts receivable of the physician program without a firm knowledge of how significantly different these differ from hospital reimbursement. Hire experienced physician revenue staff. 4 Don t underestimate the effort required in assessing the current operation, identifying opportunities, and then making the necessary operational changes to achieve those opportunities. Chances are that the current business model has been in place for some time and staff have gotten used to things the way they are. Everyone resists change unless they understand why it is necessary and what will be their role after the change takes place. Uncertainly breeds fear. Observe operations- spend time in each clinical location, talk with staff about their jobs and what works and what doesn t, trace revenue from the exam room to the bank and see where processes could and should be improved. Watch as patients arrive at the front desk, get called to the exam room, and are processed out of the practice. Identify opportunities to streamline the process and improve patient satisfaction. Physician compensation- identify disparities between income and effort. Which physicians are paid a market-competitive wage but are less productive than necessary to support that level of income. Explore the reasons behind low productivity with those physicians that were highlighted during the analysis and develop strategies to either correct the issues or quantify the best performance that can be expected from the situation. 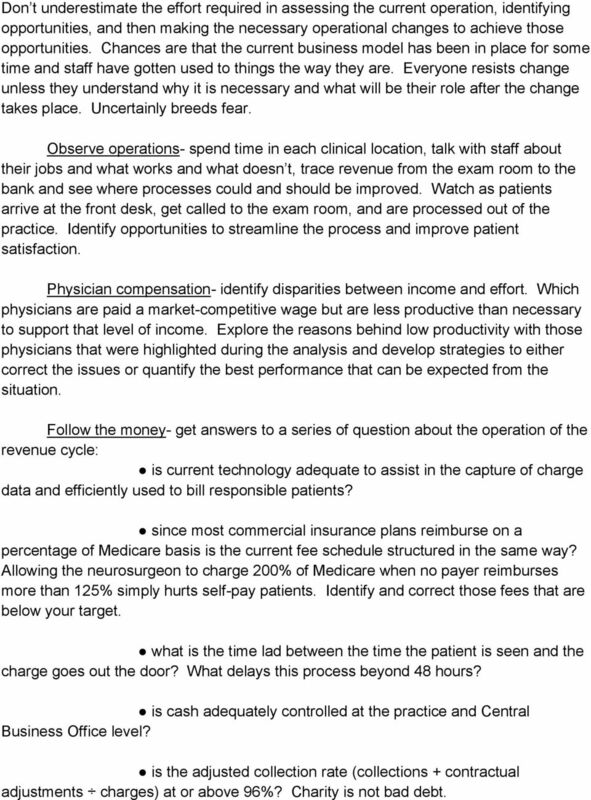 Follow the money- get answers to a series of question about the operation of the revenue cycle: is current technology adequate to assist in the capture of charge data and efficiently used to bill responsible patients? since most commercial insurance plans reimburse on a percentage of Medicare basis is the current fee schedule structured in the same way? Allowing the neurosurgeon to charge 200% of Medicare when no payer reimburses more than 125% simply hurts self-pay patients. Identify and correct those fees that are below your target. what is the time lad between the time the patient is seen and the charge goes out the door? What delays this process beyond 48 hours? is cash adequately controlled at the practice and Central Business Office level? is the adjusted collection rate (collections + contractual adjustments charges) at or above 96%? Charity is not bad debt. 5 are days in AR less than 35? This should provide a good picture of the health of the revenue cycle and identify those areas that may require more attention. Dramatically improving the financial performance of a physician network is not an easy undertaking. There are lots of moving parts and the potential for losing the trust of the physicians is a real concern. Don t begin the process unless you intend to finish. The organization will learn that resistance can help avoid change. 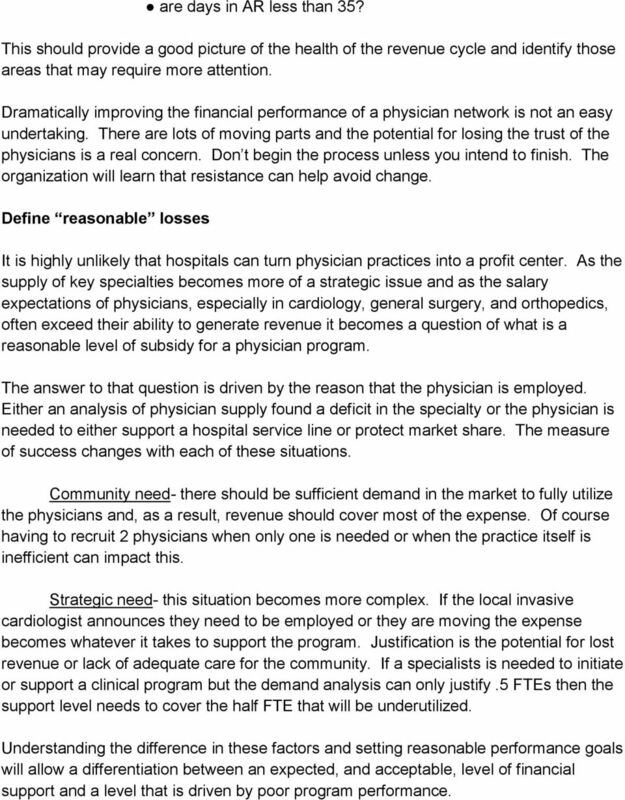 Define reasonable losses It is highly unlikely that hospitals can turn physician practices into a profit center. As the supply of key specialties becomes more of a strategic issue and as the salary expectations of physicians, especially in cardiology, general surgery, and orthopedics, often exceed their ability to generate revenue it becomes a question of what is a reasonable level of subsidy for a physician program. The answer to that question is driven by the reason that the physician is employed. Either an analysis of physician supply found a deficit in the specialty or the physician is needed to either support a hospital service line or protect market share. The measure of success changes with each of these situations. Community need- there should be sufficient demand in the market to fully utilize the physicians and, as a result, revenue should cover most of the expense. Of course having to recruit 2 physicians when only one is needed or when the practice itself is inefficient can impact this. Strategic need- this situation becomes more complex. If the local invasive cardiologist announces they need to be employed or they are moving the expense becomes whatever it takes to support the program. Justification is the potential for lost revenue or lack of adequate care for the community. If a specialists is needed to initiate or support a clinical program but the demand analysis can only justify.5 FTEs then the support level needs to cover the half FTE that will be underutilized. Understanding the difference in these factors and setting reasonable performance goals will allow a differentiation between an expected, and acceptable, level of financial support and a level that is driven by poor program performance. 6 Getting Started You might be surprised at the excellent ideas that some rank and file staff have about improving financial performance. The fact is that senior management seldom asks them and they don t offer. Take the time to solicit ideas from front desk staff and clinical support staff and you get them engaged in the process. Physicians also have some critical observations about what can be improved, especially those that used to be in private practice. During interviews these physicians quickly highlight what worked better when they ran the practice. Of course it might be important to recall that, had they been as good as their memory suggests, they might still be on their own. A sound approach to identification of financial opportunity would include: Study the data- look at provider productivity, staff to provider ratios, collection rates, AR aging and similar metrics before starting any performance improvement effort. This will identify those areas that need a closer look as each clinic is evaluated. It will also help to identify a best practices location that might serve as the model for others. Use industry standard metrics from organizations such as the Medical Group Management Association or the American Group Practice Association to identify outliers. Visit the sites- you can learn a lot from siting in the waiting room to watch patients come and go. Track time in and time out. Watch how staff interact with patients. Time phone calls to begin to build some idea of the time staff devotes to various tasks. 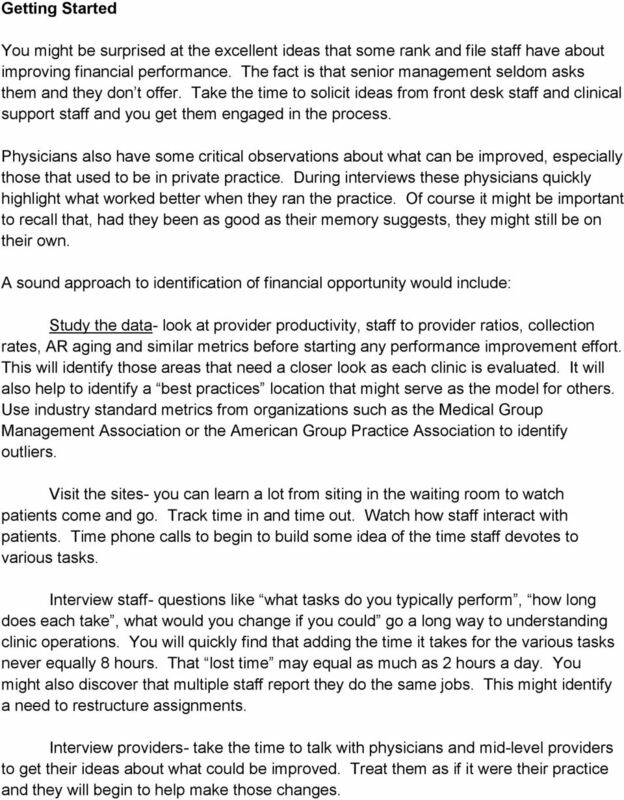 Interview staff- questions like what tasks do you typically perform, how long does each take, what would you change if you could go a long way to understanding clinic operations. You will quickly find that adding the time it takes for the various tasks never equally 8 hours. That lost time may equal as much as 2 hours a day. You might also discover that multiple staff report they do the same jobs. This might identify a need to restructure assignments. Interview providers- take the time to talk with physicians and mid-level providers to get their ideas about what could be improved. Treat them as if it were their practice and they will begin to help make those changes. 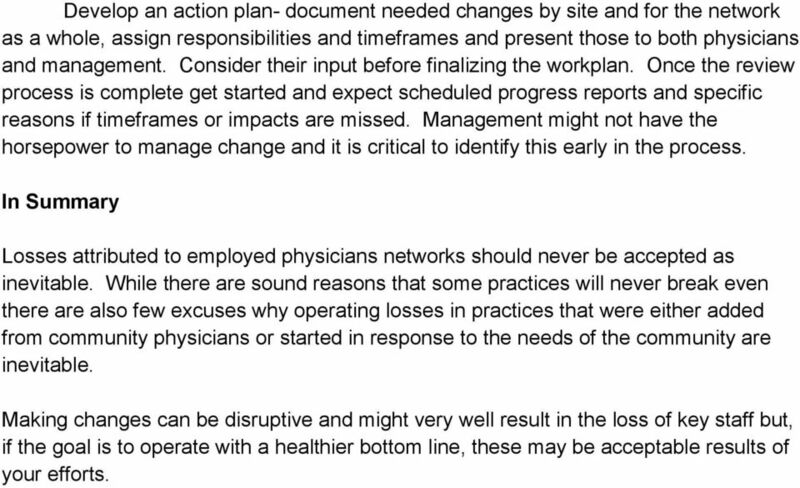 7 Develop an action plan- document needed changes by site and for the network as a whole, assign responsibilities and timeframes and present those to both physicians and management. Consider their input before finalizing the workplan. Once the review process is complete get started and expect scheduled progress reports and specific reasons if timeframes or impacts are missed. Management might not have the horsepower to manage change and it is critical to identify this early in the process. 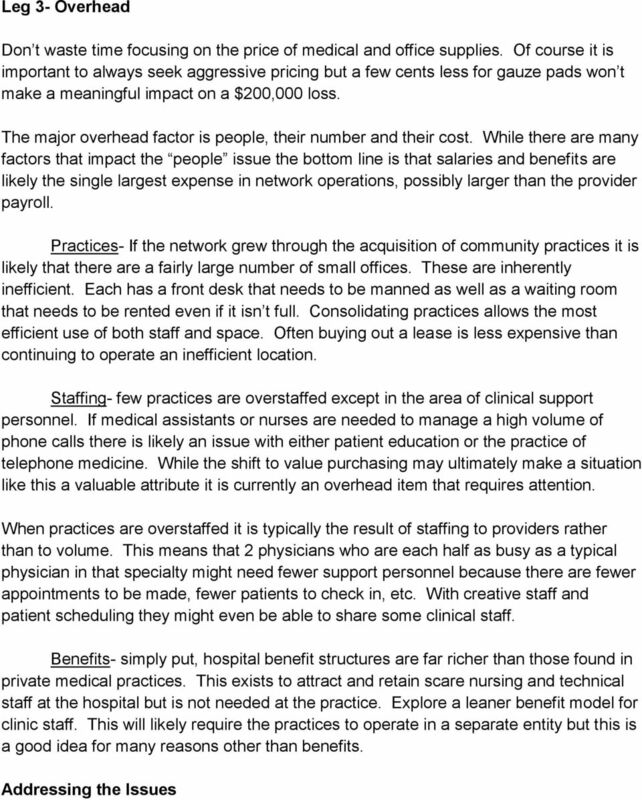 In Summary Losses attributed to employed physicians networks should never be accepted as inevitable. While there are sound reasons that some practices will never break even there are also few excuses why operating losses in practices that were either added from community physicians or started in response to the needs of the community are inevitable. Making changes can be disruptive and might very well result in the loss of key staff but, if the goal is to operate with a healthier bottom line, these may be acceptable results of your efforts. Utilizing Benchmarking to Manage Health Center Operations Curt Degenfelder Managing Director curtis.degenfelder@rsmi.com 1 KEY COMPONENTS OF COST PER VISIT! Physician Productivity! Physician Salary & Fringe! Revenue Cycle Management Excellence Easily improving bottom line!!!!! WHY OUTSOURCE YOUR MEDICAL BILLING? What Are There Real & Tangible Benefits? ON PATIENT PAYMENTS. This Web version may be reproduced for individual use. Are the financial incentives worthwhile if my job gets harder to do? 10 Steps to Building a More Profitable Construction Business Leslie Shiner, MBA Sage Certified Consultant Introduction is a pragmatic approach to developing business practices that result in greater profitability. You help your patients. We help you» DocComply streamlines your office so you can focus your energy on the what matters most your patients. How to Prosper in a Recession: Fire Your Low-Performing Salespeople! by Jeffrey L. Josephson President, JV/M, Inc.